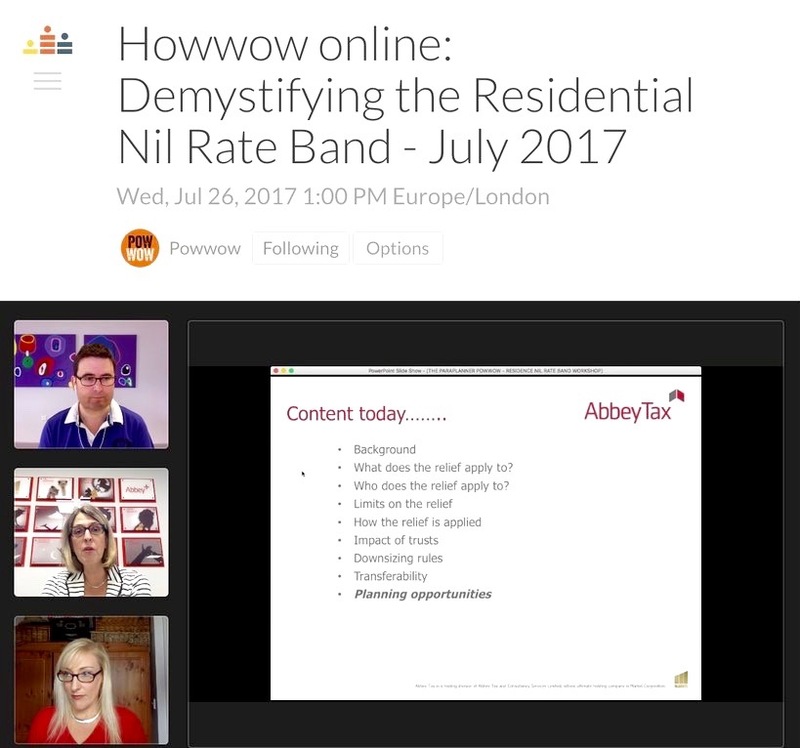 In a bit of a break from the norm, the July Howwow was an online technical presentation from Carol Wells, who is the IHT Consultancy Manager at Abbey Tax, done via the medium of – mystically waves hands – POWERPOINT. We were really lucky to be able to welcome Carol into the Powwow fold and to share some of her knowledge of the RNRB. She’s worked in estate and tax planning for many years and we’re now classifying her as an official Powwow expert too! Carol started off by giving us some of the reasons for the introduction of the RNRB and talked about the media myth versus the reality. Then from about thirty seconds into the Howwow it was clear that we’ve probably all underestimated how hard it is to calculate. The interaction between previous Will Trusts and the ability to claim the RNRB was one thing that was thrown into the presentation; how it’s calculated proportionately across the whole estate, and also, who realised failed PETS could be so appealing? Not us, that’s for sure. Carol ran through how the estate is calculated for the purposes of the RNRB and how business property relief can throw a spanner in the works. Then she went through some examples of common scenarios and answered some of your questions along the way. At this point we could feel the steam coming out of our paraplanning brains and we unfortunately ran out of time (where have we heard that before?). Q – Where a spouse died prior to the MRNRB being introduced and their share of the house (on a tenants in common basis) passed to the children or a trust, does the survivor still benefit from 2 x NRB? A – If the 1st spouse died prior to 6th April 2017 and left half share of property into trust or to the children he or she would have used part or all of their ordinary nil rate band but no RNRB. The Executors on 2nd death could claim the surviving spouse’s NRB and any remaining NRB from the 1st spouse, but also the surviving spouse’s own RNRB and a transferred RNRB. The total amount claimed would be limited to the lower of the two allowances and the value of the property in the surviving spouse’s estate. Q – If a spouse died prior to the introduction of the RNRB (April 2017) and their share of the house passes to children on second death does the surviving spouses estate benefit from two RNRB? A – Yes as long as the estate on first and second death did not exceed the upper value limit. Q – If a married couple don’t own a property, but the surviving spouse subsequently bought a property, will they benefit from a double-RNRB on 2nd death? A – Yes subject to the estates on both deaths being worth less than £2m or the upper cut off limits. If you missed out on the session or watched and your pencil broke from taking notes, why not watch again on the Powwow Crowdcast channel. Carol’s presentation is available in Powerpoint or PDF for you to download. It’s at this point we should probably put in a technical disclaimer about tax related stuff – Carol did that so we will too – we don’t have one but it’s tax so if you’re not sure, speak to an expert! Thanks for reading our latest blog. If that’s whet your appetite then check out the Big Tent and sign up to Powwow Post to get updates on future Howwows.